You are currently browsing the Archaeofacts.com archives of Musings for the day Saturday, May 20th, 2017. We spent most of the day at a 170-acre living history village-and-rural-area that is paired with an indoor museum of transportation. We began in the rural area. 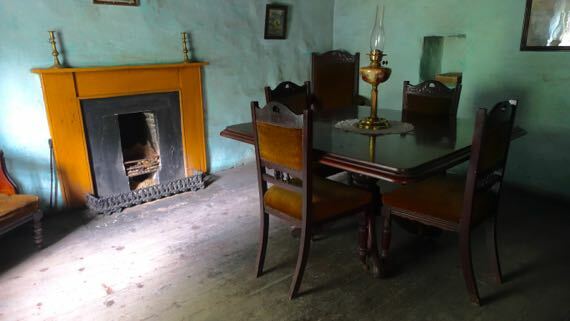 At least a half-dozen stone cottages in different styles and dates offer the opportunity to think about heating/cooking with coal or peat turves and living in close proximity to farm animals. 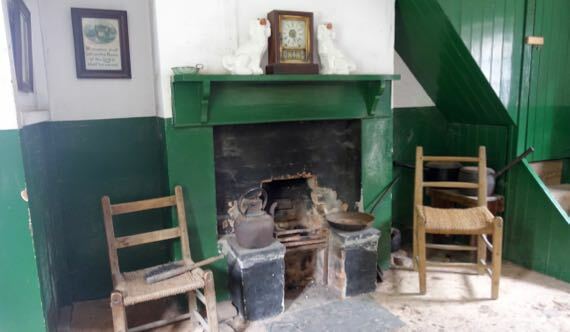 One cottage (no photo) even had a byre at one end and family space at the other—with no wall in between; maybe it was only used seasonally, however. We enjoyed a long chat with a spade-smith; he makes spades, not shovels (shovels are for loose materials). This is his water-powered trip hammer. 3K pounds of pressure per smack. No water flowing to make it trip today…. And this is a shot from a 1940 news-reel/documentary about spade and shovel making in the town of Monard, County Cork. With water power and coal-fired forges. Laborers worked six days a week. On the seventh they went to church, played gambling games, and played music and danced. Ireland had a great diversity of spade and shovel types. Over a hundred, and then many different sizes of each. Diversity. 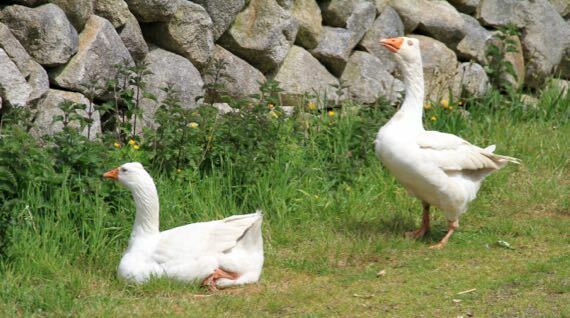 John tried a bullfighter move with these geese. No horns involved, thankfully, just hissing. 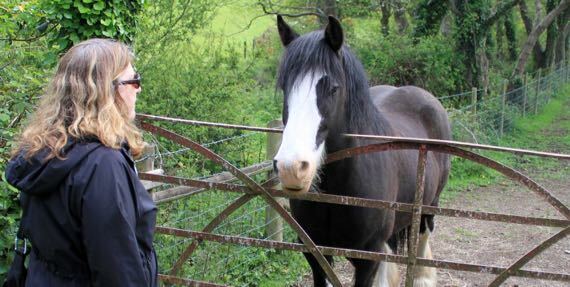 Me, I had a chat with this horse (we think in a field next to the museum property). And we both had a moment with this donkey. One lady looked around for grass-not-nettles and fed her a small handful. 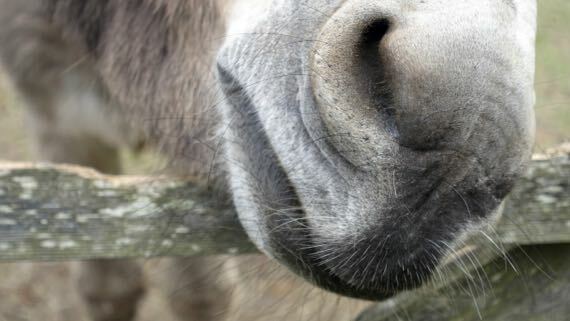 Happy day for the donkey. 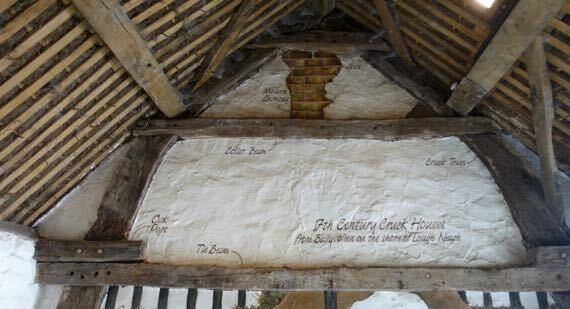 This wall is cut-away and labeled to highlight the crucks—those curving beams that go up from the ground and support the roof beams. I think folks used ropes to bend trees to make the needed shapes. 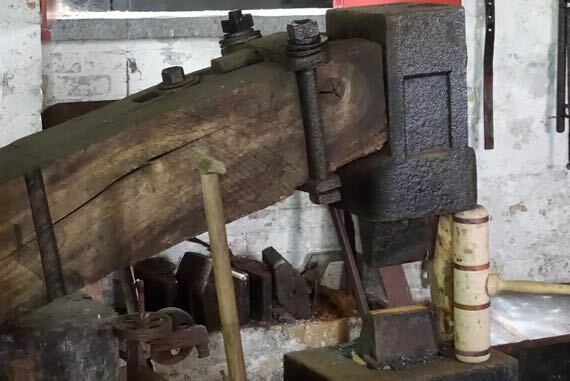 Crucks were also used in ship-building. Here’s the fireplace in one apartment in a row of village/urban row-homes with this small room downstairs, two teensy bedrooms upstairs, and a tiny yard out back with a water closet and coal bin, and a bit more room for washing laundry, etc. I thought this is the kind of place where TB would have spread quickly. 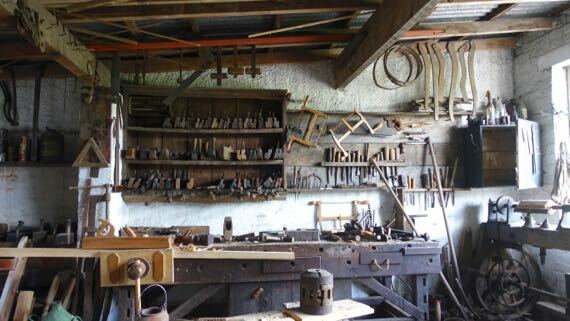 Look at the rows of tools etc. in this carpenter’s shop. Next we went across the highway to the Transport Museum. Of course, we started with trains. 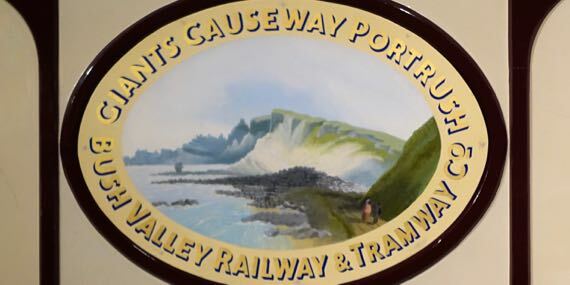 This is the shamrock detail on the County Donegal Railways seal. 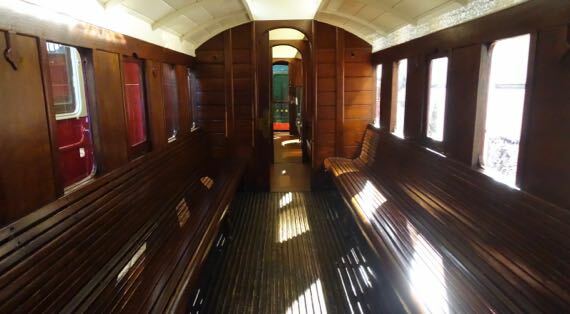 Here’s the third-class area on a train carriage. 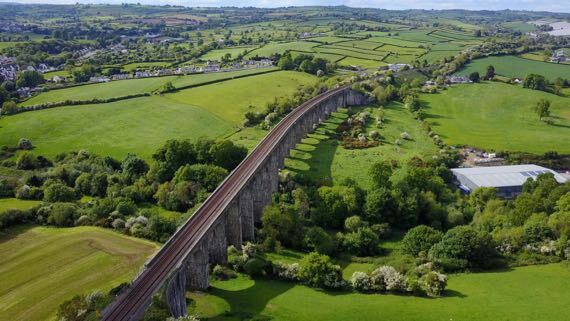 They had to pass a law in Ireland to make the railways put roofs and sidewalls on third-class spaces. They used to be like riding in a cart—just relatively low side walls, with riders fully exposed to the weather. Loved this stylized image of Giant’s Causeway and the cliffs that frame it even today. I think I read that this began to be a travelers’ destination in the 1700s. !! Cars, too! 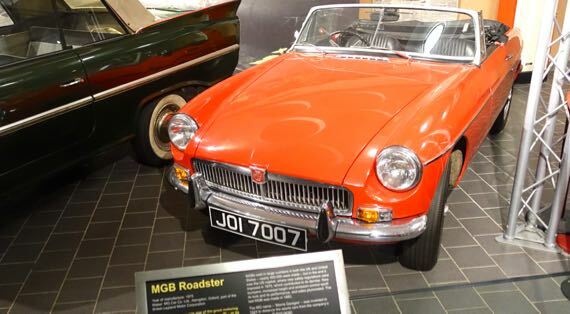 An MGB Roadster, 1975 model. Droney made two short runs, and the Guru captured the lovely shadow from this long railroad bridge during the first one. Posted in anthropology, archaeology, architecture, faunal, technology | Comments Off on Tired of ruins?